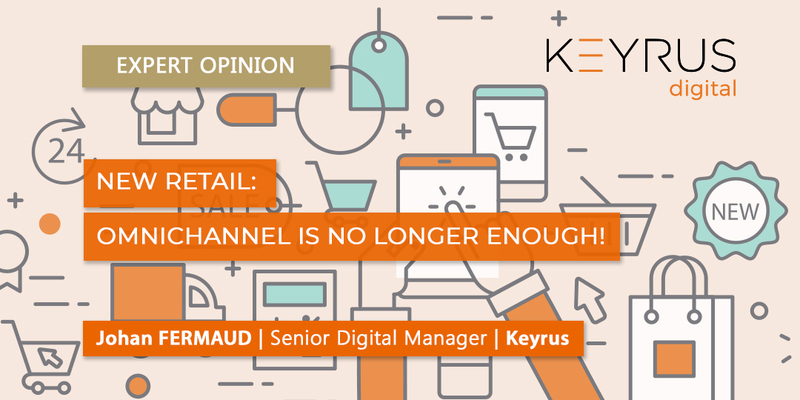 KEYRUS | New retail: omnichannel is no longer enough! New retail: omnichannel is no longer enough! Welcome to the era of unichannel. With the advent of "new retail", retailers must move towards totally merging all their sales channels. E-commerce and physical points of sale will soon become one. "Commerce as we know it is in the process of transforming itself before our very eyes", wrote the founder of the Chinese Group Alibaba recently in a letter to his shareholders. According to this entrepreneur, it is the entire face of retail that is now changing and erasing the boundary between brick-and-mortar and online commerce. Omnichannel is dead, long live unichannel, in which everything is done to guarantee consumers a fluid customer journey and an unparalleled experience. A few years ago, certain experts were already predicting the demise of brick-and-mortar stores in the face of the unprecedented growth of e-Commerce. In reality, the opposite has occurred. Except for the giants Amazon and Alibaba, the overwhelming majority of e-Commerce pure players are going downhill. This is illustrated by the recent opening of insolvency proceedings for the Pixmania site. The players who are surviving in this digital ferment are those who combine brick-and-mortar and online commerce. Moreover, Amazon and Alibaba are not wrong about this, and are already investing in points of sale. The American giant recently acquired the Whole Foods supermarket chain and opened its checkout-less concept store in Seattle: Amazon Go. As for Alibaba, it has just joined forces with Auchan and is developing its network of Hema shops. So, that's settled: 100% pure players are a thing of the past. This massive transformation by retail's disruptors is forcing traditional players to reinvent themselves from A to Z, and especially rethink the role of the physical point of sale. This is why Carrefour recently announced its highly ambitious plan to transform itself between now and 2022. Like Amazon, the retail players have grasped that the point of sale must now go digital, so as to offer a modern and homogenous customer experience. From virtual changing rooms, through to the use of mobile applications and the placing of touch screens at customers' disposal for ordering add-on products, physical stores must, from now on, offer the same functional richness as e-Commerce sites. Certain players are going even further, introducing gamification – already widely used online – to further enrich the in-store experience. For example, customers may be able to earn loyalty points by sharing brand content on the social networks, or simply trying an item. This was tried out just recently by the Stride Rite brand of children's shoes. In its stores, children were invited to try on models of shoes and then dance in them in front of a screen, so as to try to earn points. The best scores were rewarded with money-off vouchers. However, when it comes to guaranteeing a truly homogenous experience and unifying all the sales channels, the real challenge lies with the data. According to the EBG association of professionals, 57% of French people begin their product searches online, before then going into the store to acquire their desired item. In this context, it is simply not open to retailers to maintain compartmentalized information systems in which online and offline data are not connected. What is the next strategic challenge for retailers? It is unifying data, like Carrefour is doing, as it currently works to centralize its fifty-or-so databases. This structuring work will ultimately enable in-store salespeople to have available to them, in real time, the same level of information as for the marketing managers in charge of the retailer's e-Commerce site, and vice versa. For example, when a customer enters the store, thanks to the use of new technologies (apps, beacon, etc. ), the salesperson will have that customer's unified profile available to them, and will thus be able to adapt their sales pitch according to the customer's profile (online and offline purchase history, wishlist…). Another challenge posed by this unification of data is to improve the customer experience using Big Data. Indeed, these technologies open up new possibilities for retailers looking to further personalize their customers' experience. This is what the Starbucks chain does, with ultra-targeted marketing. The Group has gone from 30 customer segments to 400,000 profiles to segment its customer database, so as to be as closely in line as possible with the expectations of its 12 million loyalty card holders. The result: revenues linked to the brand's loyalty program have tripled. Thanks to new technologies, and the data analyzed, it is now possible to personalize the customer experience in the extreme: with marketing content, price highlighting for certain commercial offerings, color incorporated into the email, etc. Traders have figured it out: more than ever, the customer must feature at the center of their strategy. The arrival of the Millennials, with their high expectations when it comes to digital, as well as the growing influence of the giants like Amazon, are forcing those retailers wanting to stay in the game to innovate, invent new purchasing journeys, introduce breakthrough technologies… One example could be by offering a navigation system inspired by Tinder, enabling the retailer to propose personalized offerings to the customer in an innovative way. The customer would just need to answer a few questions at the start of their journey, and then the algorithm would select those products that corresponded to the customer. The products would be displayed one after the next. The customer would just have to swipe right or left, and could interact with their friends via the social networks, in order to teach the algorithm what their tastes were, and, in doing so, gradually refine the commercial offering displayed. Aside from the customer, the role of salespeople and employees is also being transformed with digital. An "Employee-Centric" strategy is becoming vital. And this involves much more than essential training in new digital tools. Agile Methods, Design Thinking… employees must literally be "taken on board" in the transformation of the company, so as to embody that transformation more effectively when dealing with customers. It is those very salespeople who will be at the forefront of unichannel, such as by proposing to a customer that they order an article that is unavailable instore. To achieve this, retailers are now quite willing to put in place incentives so as to be sure that their salespeople propose the most effective solution for each customer. Several brands go so far as to transform their employees into true ambassadors, as the British Group Asos does. On its site, the employees themselves wear the retailer's clothes. They become influencers on the social networks and are identified as experts by customers. Their missions are thereby broadened, and they become ever more implicated in them. It is the digital transformation that is at stake. From now on, companies – even those outside of retail – must rely on data, automatic reporting (both operations- and project-based), and objective information. Data must therefore be placed at the heart of any transformation project. In order to put an end to information systems in silos, and ensure that data are shared at all levels of the enterprise, retailers must create a technological platform built around APIs. In this way, any piece of data or algorithm created by a department will be available to be used by another of the company's departments, or even a partner external to the company. This can even go as far as open, partner-oriented platforms like Mirakl (an editor of Marketplace solutions), so as to interact more effectively with partners. Lastly, in order to bring the teams on board with the transformation more effectively, it is best to create small, autonomous teams, free of the traditional burdens of hierarchy, and to have them work in project mode. The objective: to foster initiatives, innovation, and a culture of "test and learn", and even of "test and fail". Johan FERMAUD joined Keyrus in 2017 as a Senior Digital Manager. With 8 years' experience in major digital programs, he advises companies (Large Accounts, intermediate-sized enterprises, and small- and medium-sized enterprises) on their transformation and the development of their digital strategy, and assists them in launching innovative programs. Johan has worked with major players in online retailing and the energy sector, such as Fnac.com, Galeries Lafayette, Carrefour, Groupe Rocher, Engie, Cdiscount and Rexel.